Recognizes overall excellence in business. Considerations include innovation, stability & resilience, support for community events and high quality customer service. Businesses established after July 31st 2015 are not eligible. Candy makers trained in classic candy making techniques, Nancy & Greg McTiernan are the proud owners of the Sweet Spot Chocolate Shop. Nestled in the heart of Elmsdale, Nova Scotia, their approach has always been to use only the finest, freshest ingredients; to make their candy in small batches, which is no doubt why the Huffington Post named the Sweet Spot Chocolate Shop one of the best chocolate shops across Canada. The ultimate chocolate experience awaits you at their store where you are greeted by incredible chocolate aromas and so many treats you will find it hard to choose just a few. 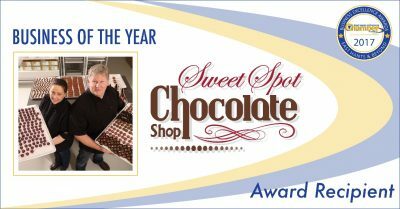 The Sweet Spot Chocolate Shop also creates original candy treats for all occasions from corporate gift giving, weddings, award shows to anniversaries, employee recognition programs, and other special events. 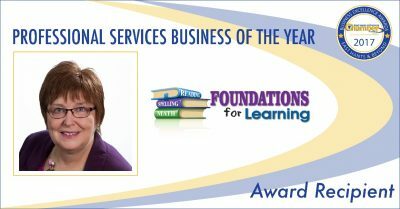 Recognizes an individual who has shown outstanding ability to manage his or her business. Considerations include strong leadership, forward thinking and community involvement. Even at a very young age food was an important part of Pam McNeill’s life. Not just for sustenance but for the whole experience. Her grandfather had the most beautiful vegetable and flower gardens, growing enough root vegetables to provide for the family during the winter months. There were apple, cherry and plum trees accompanied by gooseberry and blueberry bushes. Her family made every meal without processed food except for the odd pantry cookie slathered in butter with a cold glass of Allen’s grape juice. These memories have stayed with Pam, and the desire to bring back her sustainable roots, inspired her to open the café in 2010. 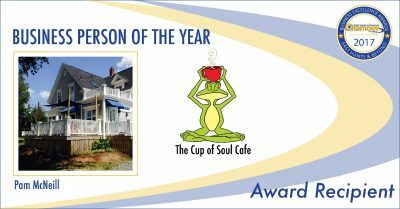 The Cup of Soul Cafe serves homemade breads, treats and use local meats and produce in their meals. Its all around real food, wrapped up in a brown paper bag, with friendly service. 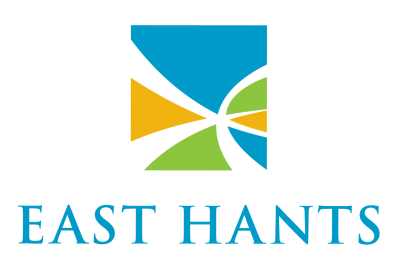 Recognizes a business or organization that is a strong supporter of East Hants & Districts many festivals, community organizations, sports groups and events. Considerations include enthusiastic promotion of community projects & donations of products or services to community events. 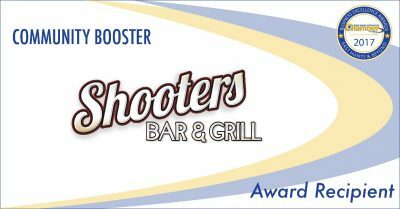 Shooter’s was established in 1996 as a poolhall club and over the years it was expanded into a full restaurant and entertainment venue. The basement was renovated to continue the pool leagues while the upstairs became a restaurant thus starting Shooter’s famous Thursday “Wing Night.” It also opened for night life with such acts as Classified, April Wine, Matt Minglewood, Paul Lamb with Wreckhouse and Signal Hill. In 2014, two local residents, Beth and Brent MacDonnell took over the reins. With a focus on customer service and community, they decided to continue with the musical acts but coupled with a more sporting theme. This is where Shooters branched out, supporting many local hockey, soccer, softball, baseball, rugby players and other charities. Shooters has donated to over 40 players or leagues in the past year alone. Recognizes outstanding achievement as an employer. Considerations include employee relations & training, workplace culture & values, community involvement and constant encouragement for employees. 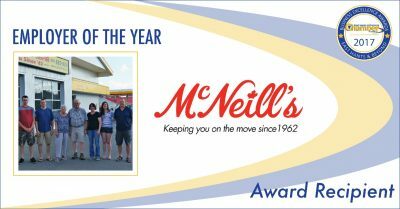 McNeill’s Shell is a second-generation family owned and operated business that has been serving the Elmsdale and surrounding communities for almost 55 years. Throughout the years, McNeill’s has seen many changes in the automotive, gasoline, car wash and towing industries. To keep up with these changes, McNeill’s continues to invest in their business as well as their employees. They encourage and support each team member to grow to their professional and personal potential through industry leading training and mentoring. Although there have been many changes in the industry and growth in the business, McNeill’s believes in maintaining their high family morals, integrity and quality of service. 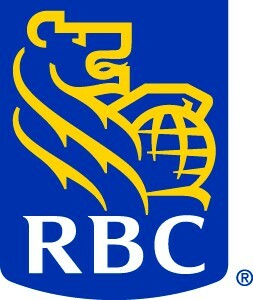 Recognizes a business that has committed itself to running in a green, environmental and sustainable way. Businesses that have introduced a “green” product or service within the past 12 months are also eligible. In 1954, Dennis Coupar Landscaping started production of nursery sod in Elmsdale. As the demand for sod increased, more dairy farms and wood lots were turned into sod fields. 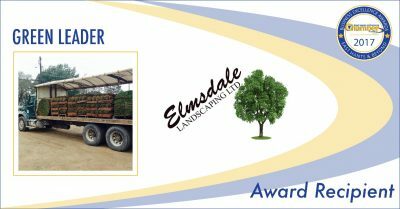 In March 1970, Elmsdale Landscaping was formed with a commitment for superior nursery sod production and increased their fleet and staff size under the management of George Coupar. They currently employ 150 people and are still thriving on their family based business model with the third generation now actively involved with day to day operations. Their other products include soil, mulch, compost and big green bags. Their premium product line is created with quality, clean organics. Recognizes a healthcare business or healthcare provider that continuously goes above and beyond to provide exceptional service to their clients. This is proven by increasing health literacy and working with clients to make informed decisions about their health care needs. 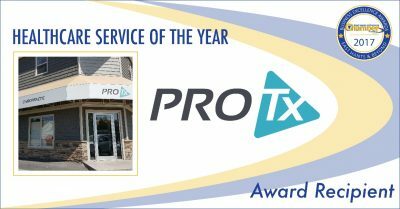 PROTX provides Physiotherapy, Massage Therapy and Chiropractic services and they are thrilled to be the professional therapy service provider of choice in the East Hants area for 2016. Their professional team includes three Physiotherapists, two Chiropractors and five Massage Therapists whose combined service equals that of 50+ years of experience. This experience, along with a caring and compassionate approach, allows their clients to successfully meet and exceed their treatment goals. Their mission is “Community First” and they are proud to be an active, valued and respected clinic in the community that they have now served for more than two years. Recognizes a home-based business that demonstrates a high level of product or service quality, branding, customer service and marketing. Allie Huybers is an online Health and Fitness Coach. She has a passion for fitness and motivating others to be their best. After her second child, two and a half years ago, she discovered the Beachbody coaching opportunity and jumped in. She was excited to lose the extra baby weight while earning an income during her maternity leave. Allie began her business by mentoring her clients to feel and look their best using online accountability groups to help them stay on track with personalized workout and nutrition plans. Shortly after seeing her clients’ success, she decided to grow her own team of coaches to maximize her impact! Her team, Fierce Factor, works hard to help as many people as they can physically, mentally and financially. She trains her team to accomplish their business goals according to each coach’s individual time commitments, lifestyle and financial targets. Recognizes the value of marketing and has successfully developed and executed an integrated marketing campaign to help promote their business, products, and services. 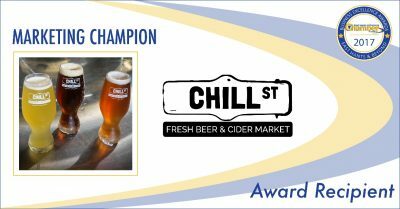 Barry MacLeod is the President and Co-Owner of Chill Street Fresh Beer and Cider Market. He was born and raised on PEI. Barry’s educational background includes an MBA with a major in International Business from Saint Mary’s University in Halifax, a business degree from the University of Prince Edward Island and he holds a Certified Management Consultant designation. Barry has held senior level positions with companies in the Seafood and Golf Destinations Marketing Industry. He has spent over 20 years of his career in the craft brewery industry, primarily involved in selling and help set up brewery systems all over the world. Barry began working on the concept for Chill Street in the Fall of 2015. Recognizes outstanding achievement as a new business. Considerations include company growth, introducing new products & services, sales & marketing initiatives and community service. This business would also show great potential for future success. Businesses open prior to July 31st 2015 are not eligible. The Barn is a Bootcamp style gym that offers customized workout plans to each member along with 35+ classes weekly. They opened up in October 2016. Emmett Blois teamed up with Bryan Gillis and together, the duo strived to create a gym where anyone can walk in off of the street and be excited about working out and achieve results. Their metabolic conditioning style has proven to be an effective method of training for all fitness levels. The Barn aims for a comfortable environment and continuously do research on how to maintain this atmosphere. Recognizes an outstanding non-profit or charitable organization that has achieved excellence by significantly contributing to the overall quality of life within the community. Considerations include programming and/or activities, environmental stewardship, education and innovation. The CCOA is a non-profit, registered charitable organization located in Enfield. They have delivered services to the communities of East Hants continuously since the mid 1970’s. They provide supported employment opportunities, training, education, job coaching, Snoezelen multi-sensory services and specialized day programs for adults living with intellectual disabilities. 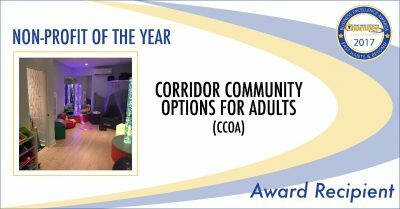 The CCOA currently supports 35 individuals and are planning to offer services to more individuals in the coming months. Rick’s Riches Thrift Store is one of their better known programs and they also operate The Sunshine Café & Catering, a Wood Products program and an active lifestyle program for people with higher support needs that is highly innovative. All proceeds from their social enterprises are used to improve and expand programs, create opportunities for the people they support and to help maintain their facility. Recognizes an individual(s) who has shown consistent, ‘above and beyond,’ customer service to customers while providing their product or service. Recognizes outstanding achievements while exemplifying professionalism and integrity. Considerations include superior customer service, market development and community service. This category includes, but is not limited to, law, accounting, financial, insurance and real estate. Working with students who struggle academically has been a passion of Sharon Prest’s since seeing the difference a remedial reading program made for her son over 25 years ago. Working as Regional Manager for Mariposa Reading Centre for over 20 years gave Sharon the experience needed to open her own centre. In March 2015, Sharon opened Foundations for Learning in Elmsdale. On June 1, 2017, she opened a 2nd location in Truro, NS. She also offers online services to students across Canada. Sharon’s goal is to provide a similar opportunity for today’s students that was provided to her son many years ago. She has watched hundreds of students become stronger academically and blossom into more confident individuals. Recognizes a restaurant in the East Hants & districts area that serves a consistent quality and excellence in food, atmosphere and service. Eligible restaurants must have been in operation for five or more consecutive years. Bitar’s has been a work in progress since 1998, starting out as a fast food take out shop, and after three expansions, they are now a flagrant full serviced restaurant. Born and raised in East Hants, Rob saw an opportunity to bring a new opportunity to the Corridor, fine dining without the drive to the city. Over the past 19 years he ventured out to create just that. 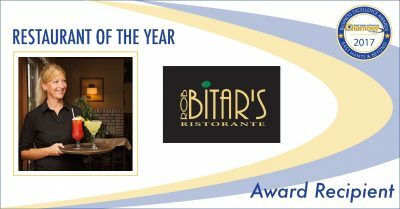 Bitar’s has been more than a business, it has been a passion project and a livelihood. Through its evolution the Bitar’s team has been working from the heart to make it better for the community. Whether you are in the mood for a fresh made-to-order pasta & a glass of wine, or a mouth-watering burger, there is something here for everyone! Recognizes an outstanding East Hants & Districts Chamber member for his or her hard work and dedication to the business community through volunteer work with regard to recreation and community improvements. * This is not a People’s Choice award. The recipient will be chosen by the EHCC board of directors. 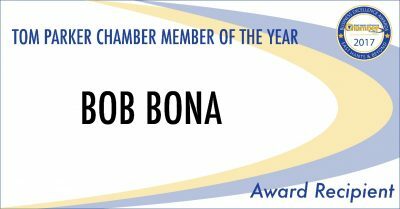 Bob Bona is a strong advocate for the East Hants Chamber of Commerce. As someone who owns commercial space for rent in East Hants he is often an early contact for new businesses looking at East Hants and he promotes the EHCC vigorously to every business. Bob is single handedly responsible for the Business Watch program and has been an active member of the Advocacy Committee. He always responds when the EHCC sends out a solicitation for feedback on issues or suggestions on how to handle a policy question. His input is impactful and his experience has been invaluable. Bob also works tirelessly in the community to support other organizations. He has been instrumental in East Hants and in the province on numerous boards to create growth and change. 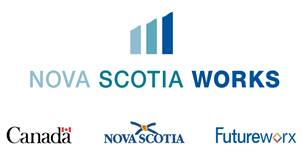 A founding member of the East Hants Chamber of Commerce, East Hants Development Commission, Canadian Federation of Independent Business, and many other associations. He invests countless hours to help develop hard working community minded youth through Earth Keepers. Always quick with a hello, smile and open to chat, tries to help whoever and wherever he can. Recognizes businesses that have a key role in raising awareness and improving the tourism and hospitality industry in East Hants and surrounding areas. 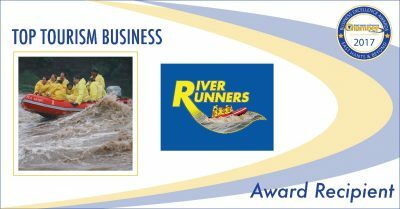 Shubenacadie River Runners is Nova Scotia’s premium tidal rafting operation – located at the mouth of the Shubenacadie River, with a breath-taking view of the Bay of Fundy. Here you can ride one of the most powerful bodies of water in the world. They offer a unique rafting experience in powered Zodiacs, where you meet and ride the famous Fundy Tidal Bore – chasing, surfing and jumping the tidal surge! Their trips are narrated by experienced guides explaining local history and geology – and eagles are a common sight along the river. Guests need no prior experience – and best of all, there’s no paddling required! Shubenacadie River Runners will ensure you an unforgettable experience with a well-maintained powerful fleet and the industry’s leading guides. Recognizes a person who is under the age of 35 and has demonstrated entrepreneurial spirit. Considerations include leadership, dedication, resilience, initiative and innovation. Futureworx values the diversity of our community and workforce and believe in “helping people reach their full potential”. 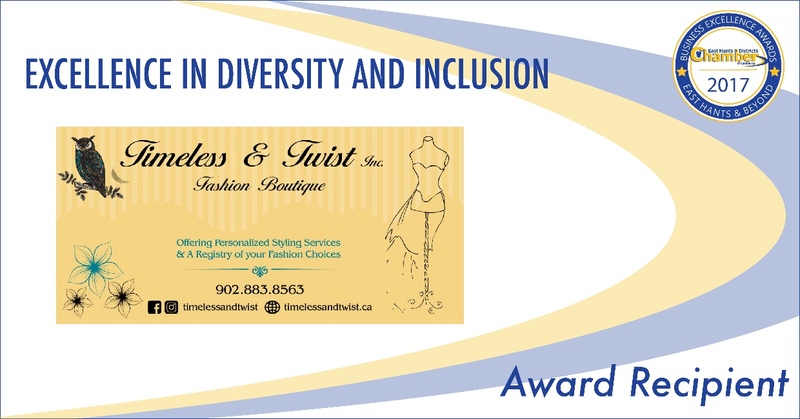 In honour of their 20th year of supporting the diverse employment needs and people of East Hants and surrounding communities, they wish to recognize an employer whom enables employees to bring their whole selves to the workforce and tap into their full potential with the “Excellence in Diversity and Inclusion Award-2017”.